These nuts are crazy good…. can’t stay out of them, everyone will be asking you how to make them, probably should triple the batch good. The combination of spicy cayenne, herby rosemary, sweet brown sugar and a dose of salt is perfect. My mom made these for a party recently and it was fun to watch the reactions as people scooped out a few, thinking they were your standard mixed nuts, only to realize they are very special. I have to warn you, they are really addictive. We used a mixed nut variety that had almonds, macadamia nuts, cashews, and pecans. There were probably some other nuts in there, I just don’t remember. For the record, nuts are much cheaper at Costco or Sams than at the regular grocery store. You may want to play with the spices and increase the cayenne if you like things spicy or change up the salt and sugar ratio. 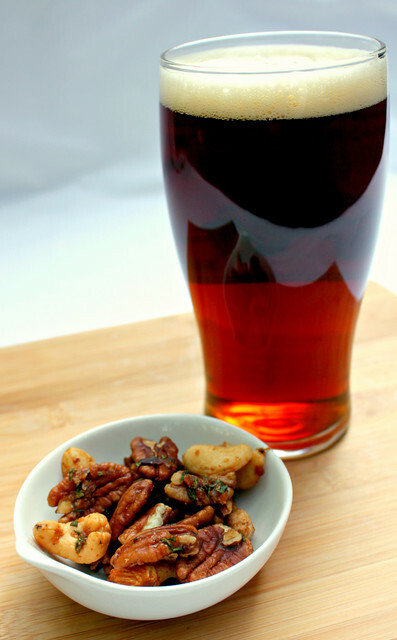 The Perfect Pairing for these nuts is a cold beer. The spicy kick is not overwhelming but it is nice to have a cold drink close at hand. Everyone enjoyed these while watching the Bears win. Bear down! 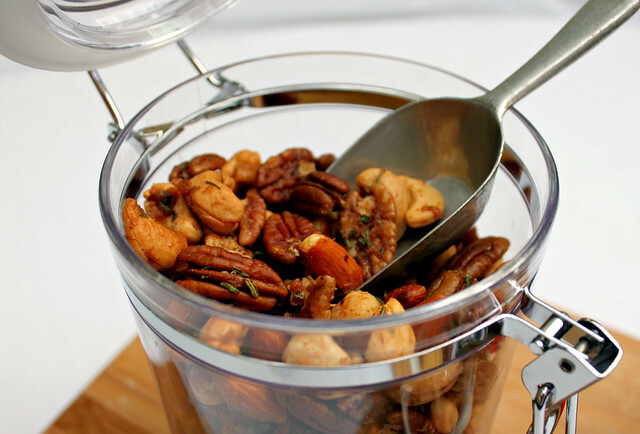 Preheat the oven to 350 degrees F. Toss the nuts in a large bowl to combine and spread onto a baking sheet. Toast in the oven until light golden brown and fragrant, about 8 minutes. Meanwhile, combine the rosemary, cayenne, sugar, salt and melted butter. Once the nuts have toasted toss them with the rosemary mixture until the nuts are evenly coated. Spread the nuts back on the baking sheet and toast for about 4 or 5 minutes, until the spices have baked onto the nuts. I've had nuts in a lot of different ways, but never with rosemary on them. Sounds really good though! Ok, so tonight I tried the batch you brought over. Get ready! Fat free vanilla icecream, fat free chocolate sauce topped with these stinking good nuts! OH MY GOODNESS!!!!! Sweet, salty, hot and spicy, and the cold of the icecream.....Oh Yeah!